Polly Rococo announces a new day. 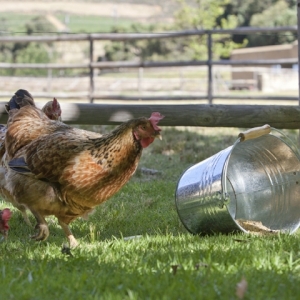 The sunrise serenade is the rooster’s proud contribution to life on Rozendal Guest Farm, where nature is applauded and the principles of biodynamic and organic agriculture take root. Rococo’s duty done, the rest of the crew stir, nudged awake by the dawn light. Truffles, Shilwan, Hugo Benedict, and Lehaina–are only some of the much-loved characters of the Rozendal tale. 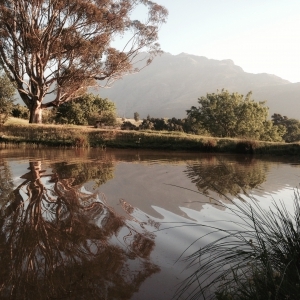 It is the story of a farm set in the seat of the Jonkershoek Valley, its loving owners, the guests who come to stay and the tranquility of immersion in the gentle life. There is a rhythmic quality to the routine of farm life at Rozendal. Production beckons with an early morning call, like a soldier’s bugle. Only it is a rooster’s croon to a new day. The cows follow the early morning lead and select the freshest pastures for their slow-food cellulose diets. The vegetable garden gathers attention. New beds are prepared, seeds sown. There’s weeding, watering and harvesting and freshly plucked herbs for the restaurant’s daily breakfasts. In the distance, Truffles (the resident pig), snuffles the soil, her snout burrowing as far as it can go. From the stables, a horse nickers (maybe it is Shilwan), stirring up neurotic, excited movement from the others. In small oak barrels contained within the Vinegar Cellar, fermentation in the French Orleans method produces the prized Rozendal balsamic-style vinegars. The Botmaskop and Simonsberg mountains evoke the farm’s boundaries as the sun straddles and hovers on the old vines, lavender fields and pear gardens. Vinegar tasting you may ask? Think heady, sweet, rich and piquant infused with Hibiscus, Lavender, Buchu, Wild Olive or kelp. Imagine a Bordeaux blend of Merlot & Cabernet grape cultivars, naturally fermented in oak barrels and infused with organic herbs, a slow maturation (nearly 12 years in total) that culminates in a deliciously sweet-tangy elixir. This labour of love harvests award-winning Botanical vinegars that come with a serious health warning – they are remarkably good for you. Enhanced immunity, reduced blood pressure and stress-relief are the upshot of a daily dose of Rozendal’s finest. And the moreish, can-I-have-another mouthful benefits are a must-try, which thankfully is possible through the Vinegar Tasting & Tours at Rozendal by appointment. Angie Stanford takes care of a small herd of horses on Rozendal. These beauties have nuzzled their way into many hearts and guests just love the chance to saddle up on Alfi, Ruben, Shilwan, Ruben, Luci-Panda or Roza. Proficiency is no obstacle to the open trail as beginners will be guided according to their ability. For those with experience, the freedom to ride, wind in hair, and dust in wake, are one of the many pleasures of the farm experience. 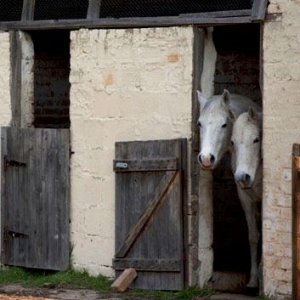 Says Angie: “Our horses are safe & full of character; our guides are proficient & helpful. From beginners to advanced riders we offer fun for all.” Bookings can be made directly with Angie on 084 5152 729. Whip out the armchair travel book, crime novel or the latest bestseller, and settle down onto a deck chair alongside the pool. Here time-out is your prerogative, and like all else on the farm, it is the gentle, patient unfurling of hours that lead to great yields. There’s no reason to rush here. A tapas platter poolside is slow-snacking pleasure in between sips and swigs of Rozendal’s famous Farmer’s Punch – a refreshing ice tea conjured with our botanical vinegar. 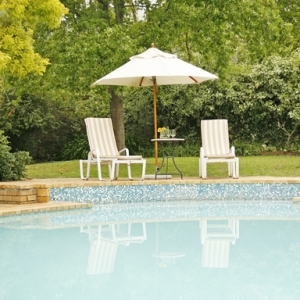 But make sure to nestle in some time for a late-afternoon dip in the water – just because you can. “Boouh-hu” is the deep-throttle hoot that you may hear from one of resident Cape Eagle Owls, also known as Bubo Capensis. They love the old oak tree on which they have staked their territorial talons. Their yellow-orange eyes and distinctive ear tufts are the perfect camo-gear that make them spotting them a bit like playing hide and seek. The edge of dawn or dusk is when you are most likely to see them. There is also a Gymnogene with its timeshare at Rozendal. Also known as the African Harrier Hawk, its blue-grey body is an inspiring sight. 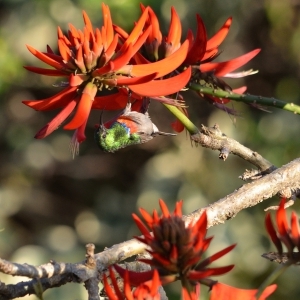 If you have your SA Birdfinder or Roberts Birds of South Africa handy, you will find that there are Weavers, White-eyes, Swallows and Hoopoes amongst the birding fray. Some binoculars and a bit of patience will stand in you in good stead for Rozendal’s birdwatching prospects. 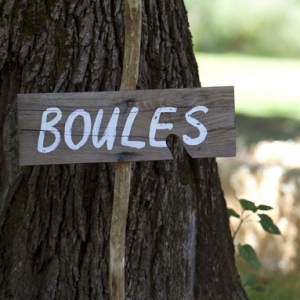 The best spot to play Boules is under the old oak trees of Rozendal. If you are French, a pastis in hand would neatly square with expectation. At Rozendal, we reserve a special tradition that we’ve named The Boules Bottle. The rules are simple: the loser buys the champagne; and so a perfectly chilled bottle always rests in the fridge. This ‘curve ball’ offers a spark of incentive to the usually relaxed and social game. Famously quoted in Elizabeth Gilbert’s Eat Pray Love, “Il bel far niente” translated from the Italian to ‘the beauty of doing nothing’ is easier to conceptualize than apply. That’s because urban life requires each gap of the day to be seized by doing. What we love about Rozendal is that the pace and place encourage guests to just take in the moments and just exhale. There’s no need for Zen gardens here, as the farm is all about nature. Unencumbered and free to observe the sounds – the hush of leaves in a gust of wind, the whoosh of a bird in flight – Rozendal is the perfect place to do nothing and feel good about it. Hugo, Jasper or Leila will happily accompany dog-loving guests at Rozendal on an exploration of the farm. Discovering belts of pasture where the animals graze, exploring the route to the Love Pond with its towering Blue Gum tree and the elevated views it yields, particularly at sunset, is a peaceful way to carve out time here. Grab a pair of binoculars, and a bird book to map out the treasure of birdlife which includes Weavers, White-eyes, Swallows and Hoopoes and the resident birds of prey. 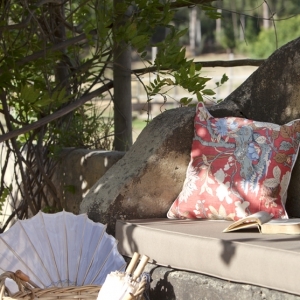 Or just grab a picnic and find an alcove along the way, where a book in hand and refreshment by your side will provide a happy sojourn before a lazy-afternoon siesta. Ready to explore beyond farm life? 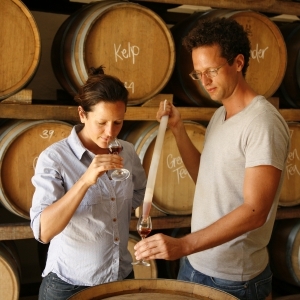 Here are some of our favourite things to do in and around Stellenbosch.